There are no tuition fees, only an administrative semester fee of 235 Euro per semester. Students admitted to the program can apply for a financial support scholarship (a partial scholarship) for the first semester. Students can apply for apartments in the student halls of residence. The Master’s program develops the qualifications needed for a Ph.D. program or a responsible position in research and development in industry and research institutes. The aim of the master's program Chemistry and Physics of Functional Materials derives from the consideration that a close connection of the scientific concepts of chemistry and physics leads to a deeper understanding of material science contexts. Hence, at the centre of the study are modern chemical synthesis processes and technologies for the functionalization of materials, chemical and physical methods of characterization as well as new physical and material science concepts such as surface-active materials, hybrid materials, composites, nanomaterials, etc. The program consists of a compulsory part on solid state physics as well as the synthesis and characterization of functional materials. This gives students a broad knowledge in the field of functional materials (15 ECTS). Furthermore, three optional modules (18 ECTS) out of six in specific application fields of chemistry and physics in material science have to be chosen. Electives (12 ECTS) and a research project (15 ECTS) prepare the students for their final Master's thesis and a final oral exam (30 ECTS). An in-depth, scientifically and methodically high-quality interdisciplinary education enables graduates to qualify further in this field of study as part of a doctoral program, as well as to work in fields of activity at the interface of natural sciences, materials science and technology of materials. Graduates can apply their expertise and creativity both independently and in a team of engineers, materials scientists and other scientists working out solutions to the issues that are a prerequisite for technological progress and future economic growth. •	Exceptions in this regard are a bachelor thesis with the grade 1.5 or better or professional experience of at least 1 year in the field of chemistry and physics of functional materials. •	Knowledge in English equivalent to CEFR B2 level is required. •	Please keep in mind that this is a scientific program in material science with equal weight placed on physics and chemistry, not an engineering program. •	Prerequisites for the classes are a scientifically based command of higher mathematics, classical physics (mechanics, thermodynamics, electrodynamics, optics) and basic modern physics (atomic and molecular physics, quantum mechanics) on the level of experimental physics as well as in the basics and applications of general and inorganic chemistry, substance classes and reaction mechanisms in organic chemistry and material laws and states of matter in physical chemistry. The University of Koblenz-Landau is one of the youngest universities in Germany and has grown considerably in its relatively short history. Since its transformation from a teacher training college in 1990, numerous new departments and institutes have sprung up. In addition, a wide range of new degree programs and chairs has been created, and existing courses and research consistently expanded. 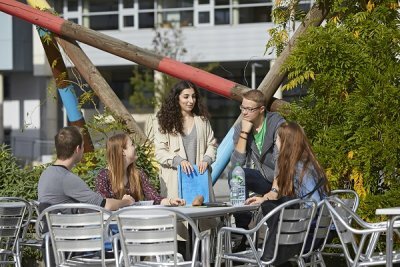 At the eight existing faculties on the two campuses in Koblenz and Landau, you can currently study Education, Arts and Humanities, Social Sciences, Sciences, Computer Science (Koblenz) and Psychology (Landau). Since 1990, the number of students has increased dramatically to about 17,000 enrolled students, with approximately 8,500 at each campus. Koblenz is one of the oldest and most attractive cities in Germany with its surroundings honoured as UNESCO World Cultural Heritage.